North By Northwest is a suspense thriller that finds Cary Grant in the role of Roger Thornhill, a Manhattan advertising executive mistaken for a spy. 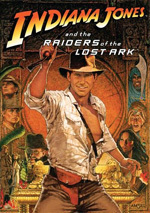 Considered by many to be the prototypical pure action movie (creating the template for later James Bond and Indiana Jones films), the film is a cross-country roller-coaster ride with Alfred Hitchcock at the helm. The film is duly famous for several classic and indelible scenes, including the desert biplane encounter and the Mt. Rushmore climax. The original title was The Man In Lincoln's Nose, which was replaced by a reference to a line from William Shakespeare's Hamlet (in which Hamlet says, "I am but mad north-north-west."). The magical combination of Hitchcock and the debonair Grant - who made four wonderful films together - makes North By Northwest a suspense-filled standout. When Thornhill finds himself in the wrong place at the wrong time, the world as he knows it comes to an end. 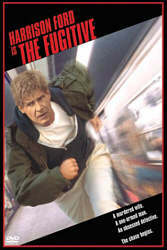 Suddenly danger threatens as the hapless businessman is targeted as an American intelligence agent and set up as a killer. All of Thornhill's attempts to straighten things out only make matters worse--and soon the desperate man is on the run from murderous foreign operatives, the CIA, and the police. The supporting cast, including Eva Marie Saint, James Mason, and Martin Landau, is uniformly excellent. Once I read a letter in an Ann Landers column that related the frustrating experience of a reader. While I don't recall the overall point of the missive, I remember that this person visited Minnesota and was asked by a native where she lived. When the writer stated "Virginia", she was told that no such place existed and she must have meant "West Virginia". The moronic Minnesotan then apparently derided the Virginian because she didn't know where she lived. Because I loathe being told I'm wrong when I know I'm right, this bizarre letter has stuck in my head for many years. A tale of mistaken identity, Alfred Hitchcock's North By Northwest takes that concept to an extreme. At the start of the film, we find handsome, successful Madison Avenue ad man Roger Thornhill (Cary Grant) at a lunch with friends. He happens to signal for a restaurant worker at the wrong time and is mistaken by thugs for someone named George Kaplan, and Thornhill's life immediately is tossed into a tizzy. The majority of the movie follows the action as Thornhill falls deeper and deeper into this bizarre world not of his making – a world that includes erstwhile lover and confidante Eve Kendall (Eva Marie Saint). This kind of story wasn't fresh even in 1959 when North first appeared. Actually, one can see bits and pieces of other Hitchcock films cobbled together for it. That doesn't mean it's not a success, as it presents an exciting and compelling tale throughout its 136 minutes. North works largely because Hitchcock paced it so well. Occasional moments dragged, but I rarely felt that the story wasn't moving ahead at an appropriate rate. Some expository moments slowed down the progress, but these remained pretty minor, especially considering the fairly convoluted nature of the plot. The tale of spies and double agents threatened to become messy, but it never quite went off-course. In a lot of ways North feels like a prototype for the Bond films. The story works from a different angle, since Bond never gets stuck in situations that become so confusing to him, but the way the tale moves and the execution of the plot feels straight out of a 007 epic. There's risqué (for the period) sexual banter, lots of good one-liners, and some well-executed action scenes that put our hero in great danger; all of this will look familiar to Bond fans. Grant plays Thornhill with terrific self-confidence and aplomb, which becomes both a blessing and a curse. For the most part, I like his performance. Actually, I really enjoy it, but I'm not sure how realistic it is. No, that's not true - I'm sure it’s not realistic at all, since Thornhill seems far too sure of himself and lacking in nervousness throughout this affair. Unlike James Bond, a regular person with no training in these sorts of endeavors probably wouldn’t respond so confidently and smoothly. Nonetheless, it makes for great entertainment, even throughout the film's multiple plot holes and unlikely events. Normally when I'm interested in a movie, I'm able to "go with the flow" and ignore silly occurrences, but some of this one's bits did irk me. Despite that, I genuinely like the movie and consider it yet another Hitchcock classic. I wouldn't place it quite on the same level as gems like Psycho and The Birds, but North By Northwest offers a terrifically entertaining and exciting experience nonetheless. 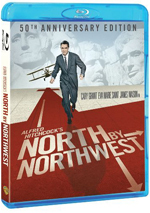 North By Northwest appears in an aspect ratio of approximately 1.85:1 on this Blu-ray Disc. Though not without flaws, the image usually impressed. In fact, only one element forced me to drop my grade down from “A”-level: a big vertical line that showed up at the 52:10 mark. I tend to forgive defects found in older flicks, and if I’d simply seen a couple of small specks, I wouldn’t have docked the transfer. However, this line is so prominent and distracting that I didn’t think I could grant it an “A-“. Otherwise I found virtually nothing to mar the proceedings. No additional source flaws cropped up through the film. Grain looked natural, and no other specks, marks or distractions appeared. Edge enhancement was absent, and I noticed no jaggies or shimmering. Sharpness was usually quite good. Some shots displayed minor softness, but I felt those instances resulted from the film’s photographic style. Hitchcock tended to like a bit of soft focus, especially in terms of his leading ladies, so close-ups of Eva Marie Saint seem a little hazy. That was intentional, though, and Hitchcock also deployed a bit of the same soft focus for Cary Grant. Both Grant and Saint played characters significantly younger than themselves, so the photographic choices attempted to distract us from that fact. I didn’t mind the visuals, though, and I thought the film exhibited very good definition. North went with a fairly monochromatic palette, so don’t expect a broad range of hues. Occasionally the film boasted vibrant reds, but otherwise, the flick remained pretty restrained. The colors looked fine within those constraints, and the brighter tones were terrfic. Black levels seemed nicely dark and solid, with good contrast to be seen throughout the movie, and shadow detail looked clear without any excessive opacity. Even with that pesky vertical line, this was an impressive presentation. I also liked the nice remixed Dolby TrueHD 5.1 soundtrack of North. The designers didn't go "audio happy" with this one, as much of the sound stayed in the center channel. The front side speakers opened up the image at times; we heard the music presented in stereo plus occasional positive use of effects like cars driving or planes flying. The surrounds contributed reinforcement of the score plus a few examples of ambient audio such as more cars and planes as they traveled toward the rear. It's an appropriately modest soundfield that nicely complemented the film. Audio quality seemed strong as well. Dialogue sounded fairly natural and warm. Speech held up better than expected; intelligibility was excellent and no edginess seemed apparent. Effects were a little thin, but they appeared fine within age-related constraints, and they boasted pretty good low-end on a few occasions. The score sounded bright and reasonably dynamic. Ultimately the soundtrack betrayed some signs of its age but it nonetheless came across very well. 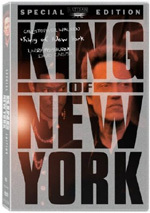 How did the picture and sound of this Blu-Ray compare with those of the 2000 DVD? I thought the audio was a wash. The lossless audio didn’t get much of a boost due to the age of the source material, so don’t expect superior sonics. Before I went into this review, I figured the Blu-ray would blow the old DVD out of the water. Many nine-year-old DVDs just don’t hold up well; North looked good to me in 2000 on my 27” set, but I doubted it’d satisfy now on my 50” widescreen TV. To my immense surprise, the 2000 DVD actually continued to please. Oh, it wasn’t a stunning presentation, but it looked a whole lot more impressive than I expected. This meant that while the Blu-ray clearly offered superior visuals, it wasn’t quite the slam-dunk I expected. To be sure, the Blu-ray was more precise and offered a smoother presentation. Nonetheless, the DVD was still quite pleasing. I definitely preferred the Blu-ray, but the upgrade wasn’t as big as I anticipated. The Blu-ray includes most of the same supplements as the 2000 DVD plus some additions. I’ll mark Blu-ray exclusives with special blue print. We open with an audio commentary from screenwriter Ernest Lehman. He provides a running, screen-specific affair that looks at cast and crew, story and character issues, working with Hitchcock and Cary Grant, sets and locations, the film’s reception, and a few other subjects. Lehman’s chat starts slowly, as he does little more than narrate for the first act or so. Matters pick up pretty well for a while, but Lehman peters out for roughly the film’s last hour. Some good tidbits still emerge, but there’s not a lot to keep up engaged. Next comes a documentary called Destination Hitchcock: The Making of North By Northwest. Hosted by actress Eva Marie Saint, this 39-minute and 27-second program provides a solid overview of the making of the film. We learn about it through interviews with Saint, Lehman, actor Martin Landau, director Alfred Hitchcock’s daughter Pat, and production designer Robert Boyle. Overall, it's a solid program that provides a nice wealth of information about the film. Special treat: Landau's killer impression of Hitchcock. Another audio track appears on North as well. We get Bernard Herrmann's score offered in Dolby Digital 5.1. I listened to parts of it and thought it sounded quite good. Its inclusion will be a nice treat for film score buffs. Three new documentaries follow. The Master’s Touch: Hitchcock’s Signature Style runs 57 minutes, 32 seconds and features filmmakers Francis Lawrence, Peter Bogdanovich, Guillermo Del Toro, John Carpenter, Curtis Hanson, Richard Loncraine, William Friedkin, Martin Scorsese, Christopher McQuarrie, Joe Carnahan, Ruth Myers, Marvin Westmore, Ruth Carter, Gary Rydstrom, and Ben Burtt, and authors Camille Paglia, David Sterritt, Steven Derosa, and Donald Spoto. We also get some archival remarks from Hitchcock himself. “Touch” offers an interpretation of Hitchcock’s filmmaking techniques. This means a mix of general notes as well as specifics about various films. “Touch” works best when we hear from Hitchcock himself. Fans have heard him address these subjects many times in the past, but that doesn’t make him any less interesting. He covers his techniques in such a precise manner that he remains fascinating. Though the others tend toward hagiography at times, they still manage to offer good interpretation of Hitchcock’s work. With almost an hour at its disposal – and scores of flicks to explore – “Touch” has the time to explore a wide variety of filmmaking areas. Rather than stick with basics like cinematography and editing, it digs into subjects such as costumes, sets and sound. Despite the occasional fluffiness, “Touch” provides an engaging and informative investigation. Cary Grant: A Class Apart lasts one hour, 27 minutes and 12 seconds. It combines archival materials, clips from Grant flicks, and interviews. We hear from Bogdanovich, former wives Barbara Grant and Betsy Drake, film historians Jeanine Basinger and James Harvey, friends Roderick Mann and Ralph Lauren, authors Nancy Nelson and Todd McCarthy, film critics Elvis Mitchell and David Denby, directors George Cukor (in 1973), Howard Hawks (1967), Alfred Hitchcock (1966), Stanley Donen and Mel Shavelson, screenwriter Ernest Lehman, writer Sidney Sheldon, and actors Martin Landau, Ralph Bellamy (1988), Dina Merrill, Eva Marie Saint, Jill St. John, Deborah Kerr (1988), George Kennedy (2003), Samantha Eggar, and Douglas Fairbanks Jr. (1988). We also get some quotes from Grant’s autobiographical essays. ”Apart” starts with Grant’s underprivileged childhood and disappearance of his mother, interest in theater and early experiences, his move to movies and the growth of his screen personality, personal relationships and Grant’s continuing career, controversies like his alleged homosexuality, the actor’s more conservative choices for roles as he aged, Grant’s penny-pinching ways, additional marriages, Grant’s refusal to have children and other personal complications, more film highs and lows, his use of LSD, the end of his acting career, fatherhood at last, and his final years. While most shows of this sort simply tear through basics about the subject’s career and personal life, “Apart” digs in with more substantial depth. Rather than just tell us dates and people involved in Grant’s films, we often get interpretation of his work and information about other elements. Those insights make this a much richer program than usual. The moments that discuss Grant’s personal life fill in various blanks, but “Apart” mostly stays with his movies, and that makes it informative and engaging. It’s a terrific documentary. Note that I referred to “Class” as a Blu-ray exclusive because it didn’t appear on the original North DVD. However, it did show up on the 2003 Bringing Up Baby DVD. For the final documentary, we get the 25-minute, 29-second North By Northwest: One for the Ages. It features Hanson, Del Toro, Friedkin, Lawrence and McQuarrie. “Ages” follows the same path taken in “The Master’s Touch”, as it looks at various filmmaking techniques and themes. Essentially it uses the same methodology but restricts itself to North rather than examine the entire Hitchcock oeuvre. As with “Touch”, the program can be a little heavy in terms of praise and happy talk. That said, I can’t argue that the film doesn’t deserve all its plaudits, and it’s interesting to look at the movie from the viewpoint of so many notable filmmakers. “Ages” digs into the flick well and becomes enjoyable. A few promos appear on the disc. We get a standard two-minute and 15-second theatrical trailer, a 60-second TV spot, and the "Hitchcock" trailer. This three-minute and 15-second piece follows along the same lines as similar ads for Psycho and The Birds in which the director himself introduces us to the film. It's not as much fun as those other clips, but it's a nice addition nonetheless. The disc also features a Stills Gallery. It includes 44 shots from the production and also some from the spring 2000 creation of the documentary. These are decent but unmemorable. Finally, we locate a hardcover book. This comes as part of the package; open up the disc’s casing and the book appears on the left half. It features a mix of components. It presents a short introductory look at the film, biographies for Hitchcock, Grant, Saint, Lehman and James Mason, and an essay called “The Ultimate Wrong Man”. It also provides various photos – with informative captions – and movie publicity. The book adds a nice touch of class to the set. North By Northwest isn't Hitchcock at his absolute best, but it's close, as the film provides a compelling mix of action, intrigue and debonair humor. The Blu-ray presents the movie in terrific fashion, with very good picture and sound plus some solid extras. Bottom line: North By Northwest offers a fine Hitchcock release and deserves your consideration. For fans who already own the DVD, the Blu-ray deserves an upgrade… but not as clearly as one might expect. While the Blu-ray looks very good, the old DVD remains more than competent in terms of its visuals. The Blu-ray’s an improvement but not a killer upgrade. However, it also throws in some nice new supplements and it’s a satisfying package that Hitchcock fans will want to pursue.